Shree Maa and Swamiji have just blessed us with a new group sankalpa in our continued prayers for World Peace. 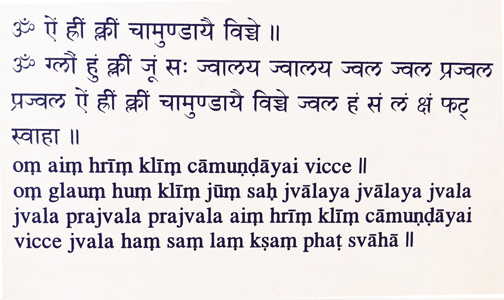 It is an expansion of the powerful Navarna mantra and is found in the Siddha Kunjika Stotram of the Chandi Path. May the collective effort in chanting the sankalpa at the same time as hundreds of other devotees work in the greatest good of all. Our group sankalpa is to complete 10,008 recitations of the mantra during this time period. So, every recitation counts! Whether you want to chant the mantra once or a hundred times, all are welcome to participate in this prayer for World Peace. You may also contact Nanda Maa at sankalpa@shreemaa.org in case of questions. What is the Value of a Group Sankalpa ? Here is what some of our participants around the world are saying . Please read their feedback.